Puerto Morelos Blog: Upcoming Events! Get out your social calendars! There are lots of upcoming events!! Oct 30 to Nov 4 - Festival of Life and Death: An awesome annual event that is put on by Xcaret each year. Oct 31st - Halloween: There will be kiddos Trick-or-Treating in and around the Town Square. The city office of Puerto Morelos hasn't announced any formal activities for Halloween or Day of the Dead. If anything is announced, I'll post it here. Nov 18 - Taste of Playa: An awesome food fair featuring signature tastes and drinks from hundreds of Playa del Caremen's restaurants. 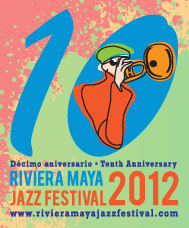 Nov 22 to 24 - Riviera Maya Jazz Festival: Three days of oceanside jazz in Playa del Carmen.